The amateur photographer often has some solution which he desires to put into a bottle which his glass funnel will not fit, says the Photographic Times. 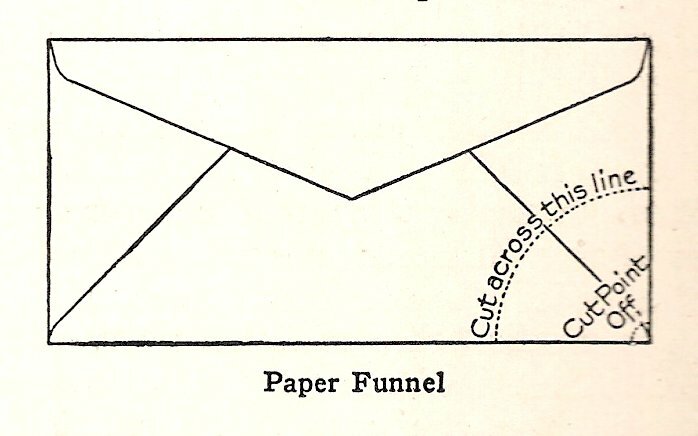 The funnel made by rolling up a piece of paper usually allows half of the solution to run down the outside of the bottle, thereby causing the amateur to be dubbed a "musser." A better way is to take an ordinary envelope and cut it off as shown by the dotter lines. Then clip a little off the point, open out, and you have a funnel that will not give any trouble. It is cheap and you can afford to throw it away when dirty, thereby saving time and washing.